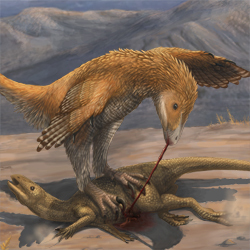 This represents a hypothetical scene from the Jehol group of early Cretaceous Liaoning of China, around 122 million years ago. 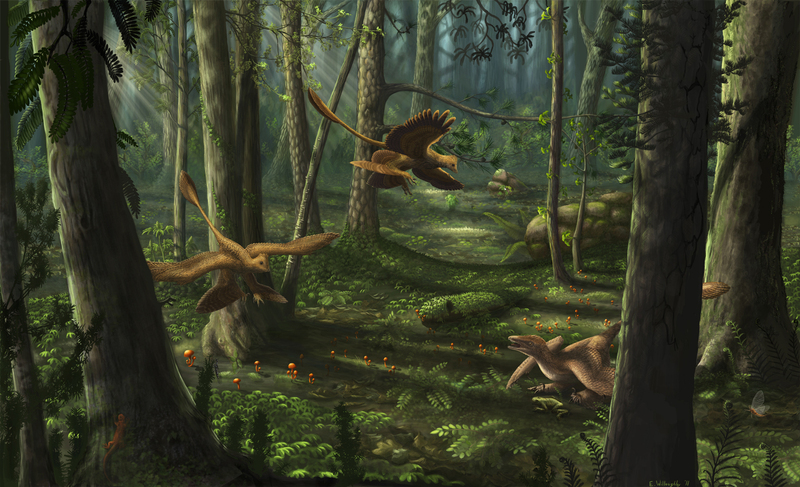 Several animals from the Yixian formation are represented here: Sinornithosaurus millennii, a feathered dromaeosaurid dinosaur; Liaoxitriton zhongjiani, a salamander; Alloraphidia, a snakefly; Epicharmeropsis, a mayfly, and a dead Callobatrachus, a frog. 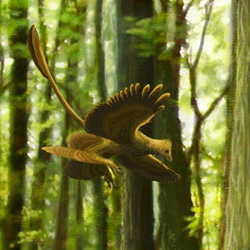 The gliding dinosaurs are meant to be generic microraptorine dinosaurs, not Microraptor gui specifically, in order to avoid the slight anachronism caused by placing Microraptor and Sinornithosaurus in the same scene. Despite that, it is (obviously) based on Microraptor gui.